Unless otherwise noted, storytimes are not held in August or December. If Lincoln Public Schools are closed due to bad weather, storytimes are canceled. Sit, sing, and listen to stories together. The more you participate, the more your child will participate, enjoy, and learn. Storytimes are short and every minute is full of fun and learning opportunities. Don’t be afraid to leave. Some days children aren’t in the right mood for storytime. If your child is having a bad day or becomes disruptive, please feel free to take a break and try again. Distractions take away from enjoyment and learning for everyone. There may be children with food sensitivities or allergies in storytime. 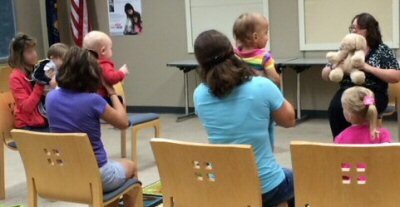 Baby Storytime is an interactive parent-child time with fun activities designed to promote early literacy, language development and a love of books for children birth to 18 months old. Unless otherwise noted, storytimes are not held in August or December. Monday, 10:35 to 10:55 a.m.
Monday, 10:00 to 10:20 a.m.
Wednesday, 10:00 to 10:20 a.m.
Thursday, 6:30 to 6:50 p.m.
Thursday, 10:30 to 11:00 a.m.
For children aged 18 to 36 months and their parents or caregivers. Toddler Time includes stories, songs, and activities designed to support early literacy skills. Research indicates the importance of the adult-child bond in building early literacy. Toddler Time also supports early literacy by building vocabulary and sharing age-appropriate literature in an atmosphere of fun, engaging activity. Unless otherwise noted, storytimes are not held in August or December. Monday, 10:30 to 10:50 a.m.
Tuesday, 10:30 to 10:50 a.m.
Wednesday, 10:35 to 10:55 a.m.
Thursday, 10:35 to 10:55 a.m.
Tuesday, 10:00 to 10:20 a.m., 10:35 to 10:55 a.m. and 6:30 to 6:50 p.m.
Thursday, 10:00 to 10:20 a.m. and 10:35 to 10:55 a.m.
Wednesday, 10:30 to 10:50 a.m. This program gets kids moving and interacting with a fun literacy component. For preschool age children. Wee Workouts will not be held from May 1 through the summer. Tuesday, 10:30 to 11:00 a.m.
Preschool Storytime is a half-hour of books and activities for children ages three, four and five. 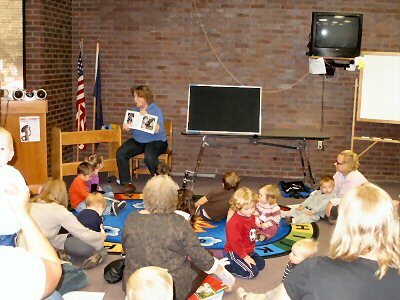 Preschool Storytime supports early literacy by offering vocabulary development, experiences with a variety of literature, and participation in language-related activities. Pre-registration is not required for Preschool Storytime, and newcomers are always welcome! Unless otherwise noted, storytimes are not held in August or December. 3rd Thursday of the month, 10:15 to 10:45 a.m.
Wednesday, 10:30 to 11:00 a.m.
Tuesday, 7:00 to 7:30 p.m.
Wednesday, 10:30 to 11:00 a.m. and 2:00 to 2:30 p.m.
Monday, 6:30 to 7:00 p.m. Incorporates folktales, fairytales and nursery rhymes into a storytime setting. All ages welcome. Unless otherwise noted, storytimes are not held in August or December. Tuesday, 11:00 to 11:30 a.m.
Wednesday, 11:00 to 11:30 a.m. The entire family is welcome to enjoy crafts and storytime. Unless otherwise noted, storytimes are not held in August or December. Sunday, 4:00 to 4:30 p.m.
Tuesday, 6:30 to 7:00 p.m.
Special Needs Storytimes – 3rd Thursday of the month, 6:00 to 7:00 p.m. This is a storytime for children and their families who may need a little extra attention or a more controlled environment. In addition to books, singing, and flannel boards, this storytime will incorporate some sensory activities. We welcome children of all abilities and seek to create an inclusive environment, but this program will be best suited to children ages 2 to 8. This program will be held in a space away from distractions and will offer a cool-down room in case participants need some quiet space. Sunday, 1:00 to 1:30 p.m.
Tuesday, 6:30 to 7:30 p.m.
Saturday, 10:30 to 11:30 a.m.
2nd Tuesday of the month, 6:30 to 7:30 p.m. Here are upcoming special storytimes for children and families. A parent-child book group for students in grades 1 to 3 and their parents. Meets the second Monday of each month, 6:30 to 7:15 p.m. at Gere Branch, 2400 S. 56th Street. Call 402-441-8560 to register. There is an easy way to improve your child’s chances at school. It will entertain and delight them. It will strengthen the bonds between you and your child. And it is virtually free. Sound too good to be true? Actually, it isn’t. The magical method: taking time to read aloud to your child. In an era of high-stakes testing and education reforms and revolutions, research has repeatedly provided that this one simple parenting technique is among the most effective. Children who are read aloud to by parents get a head start in language and literacy skills and go to school better prepared. Reading aloud to young children promotes literacy and language development and supports the relationship between child and parent. In other words, reading that bedtime story may not only entertain and soothe your child, it may also develop vocabulary, improve ability to learn to read, and – perhaps most important – foster a lifelong love of books and reading. Can’t make it to storytime? How about a virtual storytime any time with our TumbleBook Library – online story books, chapter books and videos for kids!